Wizard World Chicago is one of the biggest comic conventions in the U.S. This year, over 48,000 people attended the three day show, and once again Palisades had a great show exclusive for the Muppets line. Next year's WWC show is planned for August 13-15th, and if you don't live close to Chicago, you can hit one of Wizard's other big shows in Dallas, Los Angeles or Philadelphia. This time around it's the Vaudeville Statler and Waldorf. These two figures haven't made their debut in the regular series yet, but they will, coming with their tuxes and chairs. For the convention, Palisades produced a set wearing their vaudeville outfits, and this striking pair was available at their booth for $25. Missed the show? You can find them on ebay of course, and I also have a couple on-line dealer suggestions at the end of the review. Your best bet is to joint the Palisades Collectors Club, where these will be available to club members as well. You can't go wrong with these sturdy, attractive, collector friendly boxes. The blue color is growing on me fast, and this one has great text and graphics. I like the inclusion of the photo of the actual Muppets on the front, and as exclusives go, this one is packaged extremely well. 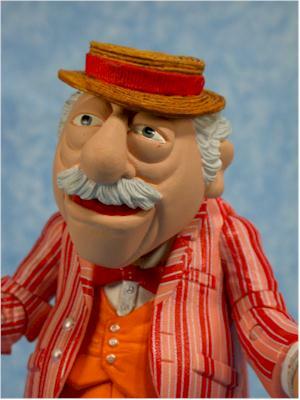 These are two of my favorite characters from the old Muppet Show, and I'm happy to see just what a fantastic job Palisades did bringing them to life. 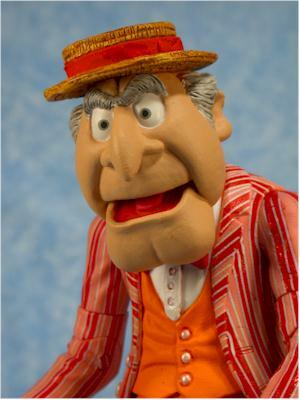 I love the facial expressions on both, and they capture the look and feel of the muppets themselves perfectly. There's tons of detail on both the head sculpts and bodies, with each button and wrinkle shown the same care and attention. The hats are not removable this time, which is a bit of a disappointment, but not a major problem. The hands are sculpted to hold the canes, and they both stand just fine on their own. The paint ops are solid, if not absolutely perfect. Figures like these require so much more detail and quality than the usual superhero, for example, and yet they manage to pull it all off better than almost anyone. The vaudeville costumes are amazing, and all the stripes are perfect. The colors are all consistent and the borders are clean between them, and there's no glopping, even on the flesh tone hands. I did have some minor problems around the whites of the eyes, with a little of the paint bleeding into the face. But in general I was once very impressed by the quality. The figures are both extremely well articulated, with a new and interesting leg joint (new to the Muppets line, at least). The figures have neck, shoulders, cut biceps, elbows, wrists, knees, waist, ankles, and a split crotch joint. Yes, that sounds rather painful, but works great with a pot bellied character like these. We've seen Palisades use these with the Year Without Santa Claus figures, and Playing Mantis did it with the Rudolph figures. This odd joint works well here, and allows the legs lots of forward and backward motion, much more than a normal crotch joint. The only negative is that the waist joint on Waldorf tend to gap, showing the inside of his body. Both figures come with one accessory - their cane. 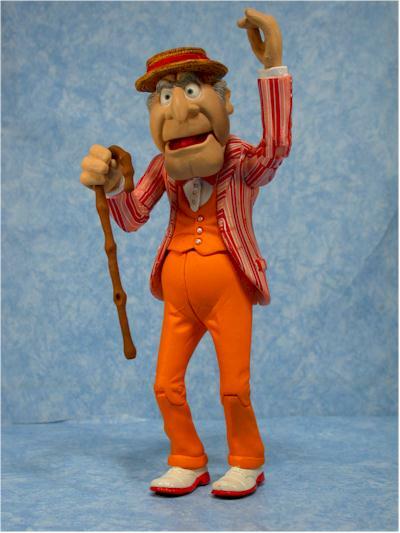 The canes look fine, fit in their hands, but are fairly basic. Still, most convention exclusives are lucky to have any accessories at all. The pair cost $25 at the show, not bad considering they are two new figures. 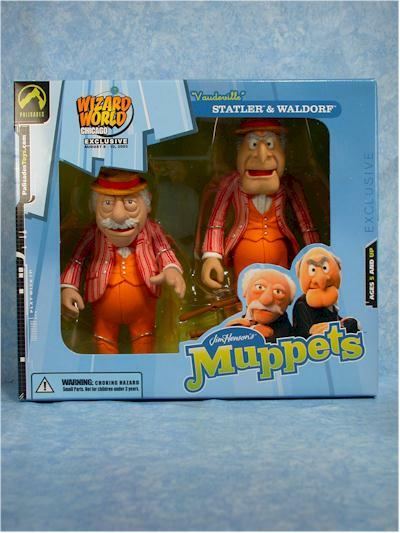 Sure, they are variants of the 'normal' Statler and Waldorf, but since those two won't be out for months, these are really the first versions. And while the tuxedo's are the garb we know them best in, these outfits are just so visually cool. In a perfect world, $18 - $20 would have been so much more palatable, and that's way they dropped a little in this category. 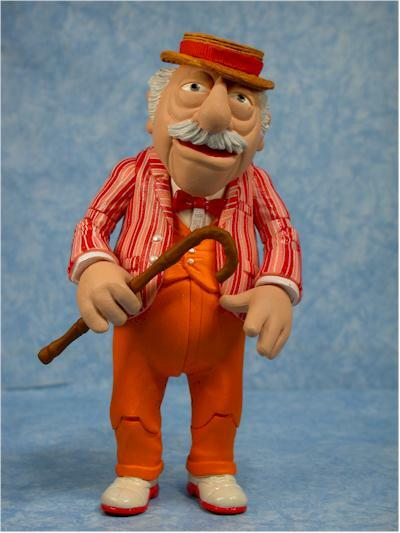 These take the top spot as my all time favorite Muppets exclusives. Sure, Vacation Fozzie is all kinds of cool, and the Koozebane Kermit is one my favorite Kermit so far, but these two look so great on the shelf that they blow everyone else away. The can't get quite as good of a score as say, Koozebane Kermit, simply because the price tag is a tad too high to keep them in the same ball park. 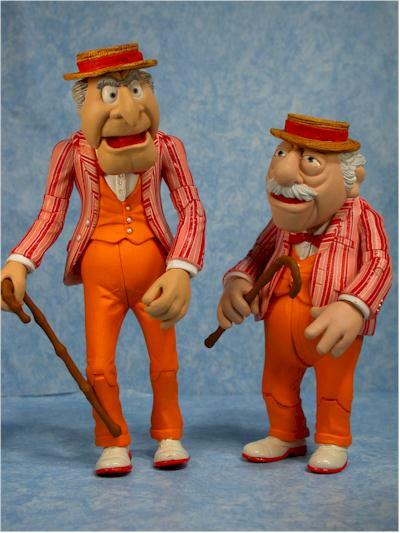 But these two look great, and have great articulation and paint ops - all on two of my favorite Muppets characters. - Killer Toys has the pair for $28 plus shipping. They also have some of the Culinary Catastrophy Chef available from SDCC . Check under the con exclusives section. - Time and Space Toys also has a few available, along with the Tour Animal. They are asking $30 a pair.